In your body, blood stem cells produce approximately 10 billion new white blood cells, which are also known as immune cells, each and every day. Even more remarkably, if some of these blood stem cells fail to do their part, then other blood stem cells pick up their slack and overproduce whichever specific type of immune cell is lacking, according to a new USC Stem Cell study published in the journal EMBO Reports. USC Ph.D. student Lisa Nguyen and colleagues in the laboratory of Rong Lu observed this phenomenon by tracking the individual blood stem cells that reside in the bone marrow of mice. To create the tracking labels, the scientists attached a unique piece of genetic code to each blood stem cell. During blood production, each blood stem cell passes its unique genetic label onto its progeny—which include two types of immune cells, known as B cells and T cells. To test the contributions of these uniquely labelled blood stem cells, the scientists performed a series of bone marrow transplantations in mice. 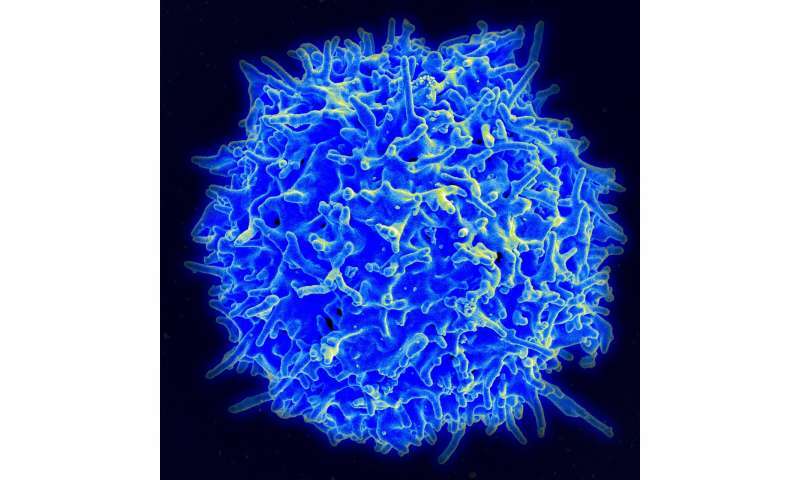 Mice received a combination of normal blood stem cells and deficient blood stem cells with a genetic mutation that prevented them from producing either B cells only, or both B and T cells. The scientists found that the normal blood stem cells compensated for the B and T cell deficiencies. When co-transplanted with B-deficient stem cells, the normal stem cells overproduced B cells to keep the immune system in balance. And when co-transplanted with B- and T-deficient stem cells, the normal stem cells compensated by overproducing both B and T cells to maintain a balanced immune system. Furthermore, the scientists found that a few specific blood stem cells were doing most of the work. These key blood stem cells proliferated dramatically to compensate for the immune cell deficiencies in the recipient mice, and these cells continued to proliferate when they were transplanted into different recipient mice. Furthermore, these highly productive blood stem cells showed changes in gene activity that enhanced their ability to oversupply deficient types of immune cells. "These stem cells' ability to compensate provides some degree of resilience to disruptions of the blood and immune system—such as the aging process, the early stages of many blood cancers and disorders, and bone transplantation," said Lu, an assistant professor of stem cell biology and regenerative medicine at USC. "By understanding and ultimately harnessing this innate capacity of stem cells, we can potentially optimize treatments for a wide range of diseases."